November 10, 2013 2 comments on "Andes Mint Cookies"
I ran across this recipe for Andes Mint Cookies a couple of months ago and couldn’t wait to try it. It looked liked it would make a great Christmas cookie to give to family and friends. They are also a great cookie to make for Christmas cookie exchanges. These cookies are so easy to make. Preheat oven to 350 degrees. Mix the cake mix, vegetable oil, and eggs together in a bowl. Drop by spoonfuls onto a cookie sheet and bake for about 8 minutes. Cookies should still be soft on top but lightly browned on the bottom. Remove cookies from cookie sheet and place on waxed paper. 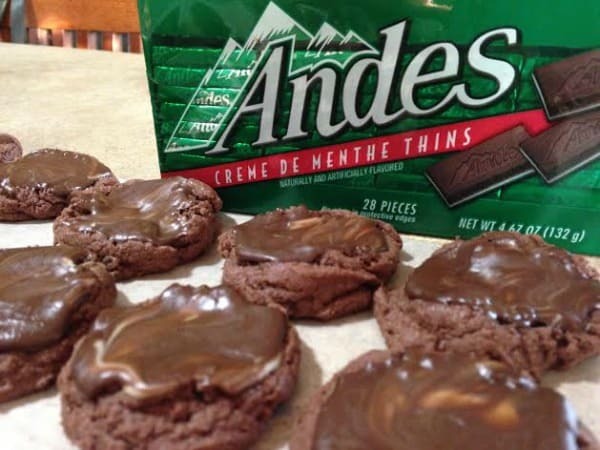 Place one unwrapped Andes mint on the top of each cookie while the cookies are still warm. Let the candy sit for a couple of minutes until completely soft. Use a knife to gently swirl the chocolate on top of the cookie. Let cookies set until the chocolate re-hardens (although some may disappear from the counter while they are sitting). Like this recipe? Try my recipes for Hershey’s Kiss Cookies and Candy Cane Kiss Cookies. 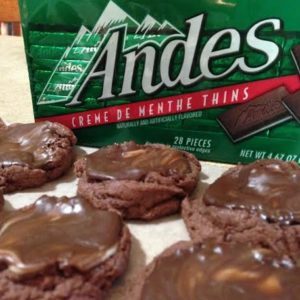 2 Comments on "Andes Mint Cookies"
Hi! This recipe makes about 2 1/2 dozen cookies. I usually double the recipe.